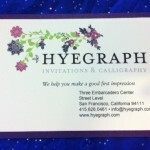 At Hyegraph Invitations & Calligraphy, we use a Computerized Calligraphy for Addressing Envelopes. This is a more affordable alternative to hand calligraphy with faster turn-around-time. We get great results and hundreds of satisfied wedding clients, planners and corporate companies. We work closely with our Wedding Couples for an elegant Wedding Envelope Calligraphy. 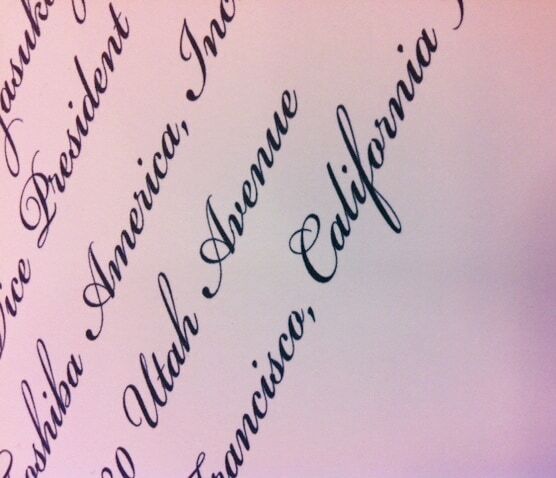 Our Wedding Calligraphy compliments the Wedding Invitation font style and Wedding Envelope Addressing. Our Wedding Printing Service is set up for fast, efficient and beautiful hand lettered look with printed calligraphy. Wedding Invitation Envelope Addressing Calligraphy www.hyegraph.com available in San Francisco and nationwide for fast, affordable calligraphy service. The above Calligraphy Envelope Sample, illustrates our “Script” Calligraphy Font printed on elegant Wedding Envelopes resulting in a beautiful, hand-lettered look. We use this computer calligraphy for invitation addressing on a regular basis not only for our Wedding Calligraphy Services but also for our Party Planners for their Corporate Envelope Addressing and for Business Envelope Addressing. 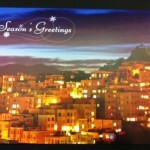 Our clients are satisfied and send out their invitations in style with our Invitation Addressing Service. To see more Calligraphy and Invitation Styles please see out Blog. To see more calligraphy envelope addressing see our Calligraphy Page and Envelope Addressing Page. To see our Satisfied Clients please see our Testimonials Page. Please contact us with any inquiries!